Managed to get some time to myself this weekend. So what did I do? Start more projects of course! My nana’s 80th birthday is fast approaching and after toying with several ideas I’ve settled on making a photo memory frame. 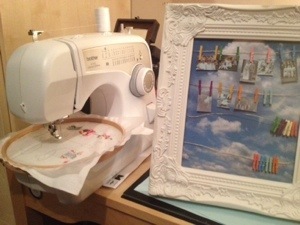 So far I’ve glued a blue sky on to the background and strung some miniature pegs on picture hanging wire. The difficult bit is deciding on the photos! I spent Sunday afternoon going through hundreds of family photos to try and get one of everyone. I’m pleased to say I even managed to get one of my great great grandma. I’ve printed some off on scrap paper to get an idea. Just a few uncles and brothers (always the men!) to chase for photos. I also had the brilliant idea to freehand machine embroider an afternoon tea scene for a friend who works in the tea trade. It’s a great use for some tiny scraps of fabric left from bunting. I’ve basted the appliqué, I’ll save the embroidery for later in the week.